HMH Books for Young Readers, 9780547820118, 128pp. Matthew Cordell has illustrated many picture and chapter books for children including Wolf in the Snow, which won the Caldecott Medal. He lives with his wife and their two children outside of Chicago, Illinois. Visit him online at matthewcordell.com and on Twitter @cordellmatthew. "Just the thing for readers with a burgeoning interest in poetry—or angling." 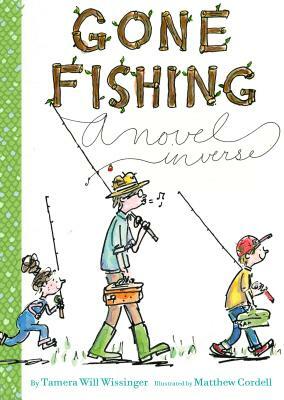 "A playful verse narrative of the joys and perils of a family fishing trip. . . . This tender, well-crafted sibling story should hook many readers." "Engaging verse that's just the right depth and length for chapter-book readers. . . A solid, entertaining story to hook children on poetry." "All of Sam's episodes take the form of poems, each discreetly labeled by its poetic form, which is then defined at the end of the book. . . most will enjoy the notion that there are as many ways to tell a tale as to catch a fish." "This novel in verse successfully builds a story filled with anticipation, family humor, and sibling rivalry. . . . Wissinger deftly plies her craft to ensure that the use of poetry enhances the readability of the story"